Tight three-way race opens a familiar door. 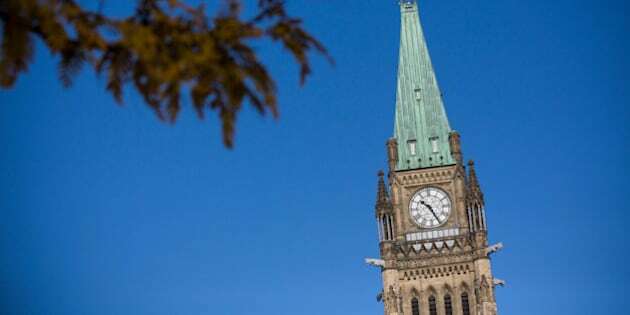 A tight three-way race among the federal Conservatives, Liberals and NDP has raised the possibility of a coalition forming government after the Oct. 19 vote. Various campaign polls have suggested that whichever party does take the most seats in the election will almost certainly only have a slight minority — opening the door for a coalition to step in. Both the Liberals and NDP have made it clear that removing the Tories from power is their top priority, but their leaders have offered contrasting takes on how open they would be to forming a coalition to achieve that goal. ​Liberal Leader Justin Trudeau said this week that the Grits are "always open to working with others, working with others in the House to make sure that the legislation passed is lined up with the needs of Canadians." While informal alliances struck for political expediency are commonplace — such as when parties vote in step to ensure that a budget passes — a formal coalition is another story entirely. There has only been one federal coalition in Canadian history. It came during the tumultuous years of the First World War, when the issue of conscription divided Sir Wilfrid Laurier's Liberals, resulting in an overwhelming majority for Sir Robert Borden's Unionist party in the election of December 1917. The modern-day Liberals under Trudeau hold the position that "Canadians want a clear government with a strong plan." "The fact is Canadians aren't interested in formal coalitions," Trudeau said during a campaign stop in Nova Scotia on Tuesday. It's a position that Trudeau has wavered on in the past. He said in April, long before the election campaign kicked off, that he might be open to the possibility of forming a coalition with the NDP — but only if Tom Mulcair was not NDP leader. "We have very different perspectives on how politics should be practised," he told reporters at the time. Mulcair has himself been part of an effort to form a coalition government with the Grits. When the late Jack Layton was at the helm of the NDP, Mulcair was part of the group that negotiated with the Liberals with the intention of forming a majority coalition government following a vote of non-confidence that was expected some six weeks after the Tories won the Oct. 2008 federal election. The non-confidence vote never happened because Conservative Leader Stephen Harper requested Parliament be prorogued, and the request was granted. When Parliament reconvened, the Liberals pulled out of the deal. In an interview with CBC's Chief Correspondent Peter Mansbridge this week, Mulcair said the Grits "turned up their nose on their own signature," killing the deal and leaving Harper in office. Mulcair added that any attempts to discuss a coalition with the current Liberal leadership have failed. "I have opened that door several times, but it is he himself who has slammed the door shut conclusively every time we've raised that," he said. "My priority is to get rid of Stephen Harper. Apparently Justin Trudeau's priority is to get rid of me." But the NDP leader has not ruled out the possibility for a coalition in the future. "What I've said all along is that we were willing to work to make sure that we replace Stephen Harper's Conservatives," he told Mansbridge. Green Party Leader Elizabeth May said in the case of a Conservative minority government, she would be prepared to call the Governor General to ask to be given time to mediate a coalition with the opposition parties, even though she said her party would not be part of the coalition itself. May said that she didn't want to see the Conservatives form a minority government "simply because the NDP and the Liberals were paralyzed by their hyper-partisan dislike for each other." For his part, Harper has been an outspoken critic of coalition governments. In 2011, when polls suggested that the Tories would win the most seats but only form a minority, Harper repeatedly denounced the idea that the opposition parties would take power by forming a coalition, saying it was an illegitimate way to form government. "My view is that the party that wins the most seats in our system forms the government," he said during an Ontario campaign stop this week. "I've always lived by that and I hope that party is us." The Bloc Quebecois would have also played a critical role in the proposed 2008 coalition that never came to pass. Leader Gilles Duceppe has said during this campaign that he remains open to the possibility of a coalition with the Liberals or NDP, but not with Harper's Conservatives.